Zongzi, or rice dumpling, sticky rice dumpling, is one of traditional Chinese food and Chinese dessert. It is glutinous rice wrapped in big plant leaves. It has a long history, started from 2000 years ago, or earlier. Traditionally it is served on the fifth day of the fifth month of Chinese Lunar Calendar. This day is also called Duanwu. It's Duanwu Festival, or Dragon Boat Festival. From this day it'll become hotter and hotter. We begin to feel sleepy and exhausted because of the summer heat. At this moment Yang Qi exists on the surface of our body to balance the hot weather. While Yin Qi is heavy inside the body. Many people take much cold drinks in summer. These may cause extra cold to stay in our body, which will lead to cold or cough in autumn or winter. Glutinous rice is used in Zongzi. It has warm energy and supplements Qi. So eating Zongzi is good to our health on the eve of hot day. Originally Zongzi was used for sacrifice on that day. Later it evolved into the memory for a patriotism Quyuan. People throws Zongzi into the sea to feed fish and shrimp, so that Quyuan's corpse cannot be eaten away. People also row dragon boat to disperse the fish and shrimps. That's why there is dragon boat race on that day. (but dragon boat race started 5000 years ago). People usually use reed, bamboo, or other big plant leaves Zongzi wrapper. These leaves can clear away heat, bringing Zongzi refresh taste. Zongzi fillings are various but must have glutinous rice. Northern people like pure sticky rice, or with small red bean, or with small Chinese date, serving with sugar. People from south like to mix with meat, ham, shrimp, mushroom, or other beans. These are called salty Zongzi. The most delicious Zongzi is stuffed with preserved egg yolk and pork. Many salty Zongzi contain much oil and lard. Don't eat too much one time. Eating Zongzi in Duanwu also extended to Korea, Japan, and southeast Asia. Glutinous rice is high GI food. Diabetic should eat those fillings which contain various beans but without added oil. It's easier to make Zongzi than that of other dumplings. But you need practice. 1. Soak glutinous rice over night, or 2 nights if you prefer sticky taste. 2. Soak Chinese date in warm water for at least 30mins. 3. Soak and boil for 5 mins if the leaves are dry. 4. Take one big leaf (or 2 small leaves fold together). Fold at 1/3 point, making a cone shape. The tip is downward. Hold in a hand. Add one Chinese date on the bottom. Add sticky rice (about 25g). Add additional 2 Chinese date. Add sticky rice again. Now the cone is filled. Fold the leave of the other side, cover the fillings. Bundle with one of the ropes tightly. Repeat the rest 5. 5. Put Zongzi in a pot. Add water covering Zongzi above 1/3. 6. Bring to a boil. Continue boil for 2 hours in low-medium heat. 7. When it becomes warm, take away the leaves,serve with sugar, honey, or jam. Rong Zong, Pork and Duck Stuffed Zongzi. When making salty Zongzi, soak sticky rice in soy sauce. Marinate pork blocks with ingredients. Other procedure is the same. Tips: Don't serve too much one time. 1 or 2 is enough. 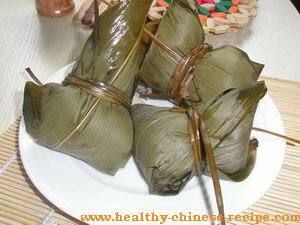 Zongzi is not suitable for people who are with diabetes, obesity, or hyperlipidemia. It's suitable for people who always feel cold in winter.